With about 50’000 unique visitors and 200’000 page impressions per month, myScience.ch is the portal for scientists and academics in Switzerland. *One week corresponds to at least 50’000 page impressions. You pay only per page impression, i.e. how many times a page containing your ad has been visited. 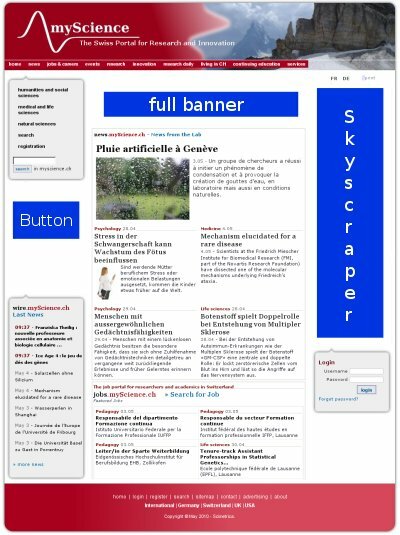 If you publish for example a button during one week, your ad is displayed on 50’000 pages. Postitioning on every second page (run of site). About two third of advertisers say that online advertising has a positive effect on customer acquisition, sales, intent to purchase, and brand awareness and that online advertising is important (Source: European Interactive Advertising Association). One automotive company is quoted saying: "[The best about Internet advertising is] the ability to target individuals and offer a deeper brand experience than a 30 sec TV ad can do." Furthermore, a new study proves that online advertising has an effect even when users do not click the ads (read more).